War Criminals Watch is joining with the ACLU, Amnesty International, many other organizations, artists and musicians like Tom Morello and Trent Reznor to “flood Twitter” and Facebook today, Thursday, January 21st with messages to #closegitmo. 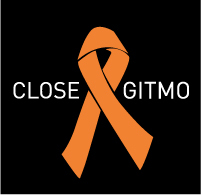 YOU can help, by spreading the word now, and tweeting messages tomorrow about Guantanamo, torture, habeas corpus rights, and more – using the hashtag #closegitmo. You can also “donate” your Facebook status for the day with this message. We want to dominate the social networking discussion on Thursday with the message that torture and the prison at Guantanamo still continue, but must be stopped. Follow us on Twitter at worldcantwait, and go to the link below to find an image to use for the day on as your Twitter or Facebook avatar. Check out the stream of tweets about closing Guantanamo here. Thursday January 21st – more than a year since Obama promised Guantanamo would be closed, join us in flooding twitter and facebook with the message to #closegitmo. Use this image for the day as your avatar. The Fast for Justice led by Witness Against Torture began today, on the 8th anniversary of the opening of Guantanamo, with 50 people here in Washington, and another 75 around the U.S. Fasters marched in orange jumpsuits in front of the White House, and then performed guerrila theater. “Bush Justice” turned into “Obama Justice.” Guanatanmo became Bagram, and Guantanamo, Illinois. Attorney Pardiss Kebriaei from the Center for Constitutional Rights, told of visiting her clients several times with good news. In June 2008, she told them U.S. courts were allowing them to file suit. 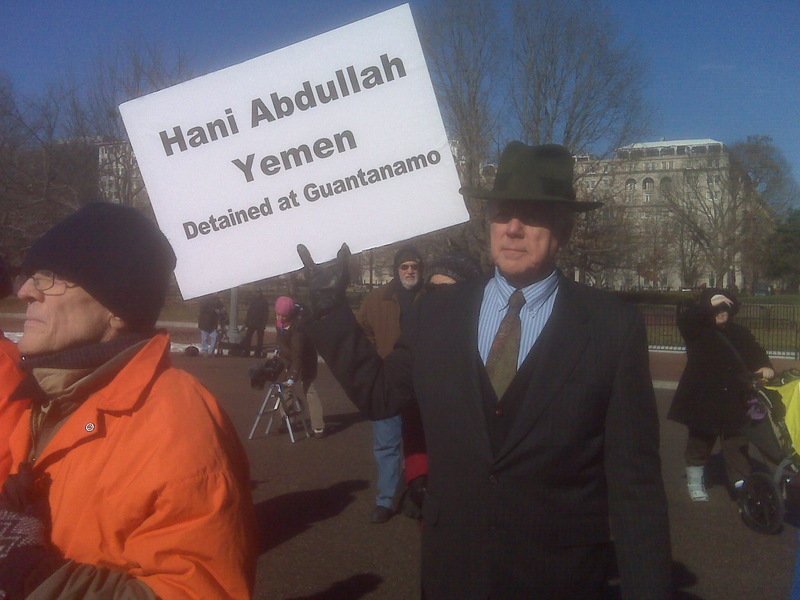 In November 2008, a new president who campaigned on closing Guantanamo was elected. In January 2009, he made an Executive Order closing Guantanamo. 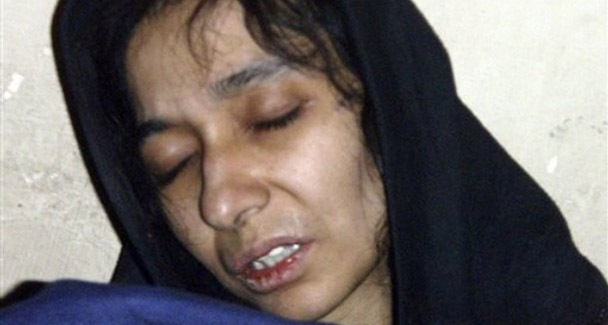 Some of her clients have been cleared for release, meaning that the U.S. government has no intention finds they do not need to be held further. Yet her clients are still sitting in Guantanamo. What is good news worth? A reporter asked if the Guantanamo lawyers are angry at the delays. 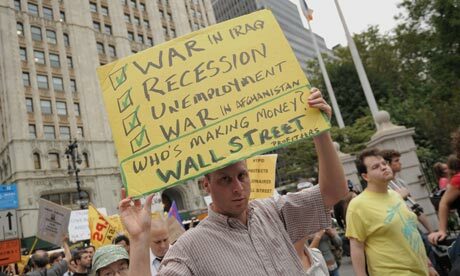 “We are increasingly disillusioned, and angry too” she said. 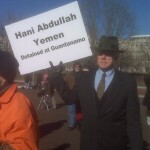 client’s name, Hani Abdullah, a Yemeni. He can complete corporate deals, but not get this client sprung. It’s a messed up situation, as a high school student visiting the scene from Maryland told me. 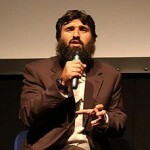 Last night, together with the people about to fast, we watched Andy Worthington’s film about the lives of the detainees. The room was silent for awhile after it ended, as the weight of the injustice and years of detention settled. But then we got to talking. A friend and playwright, along to participate in all this, remarked on two things I noticed about Omar Deghayes’ comments in the film. 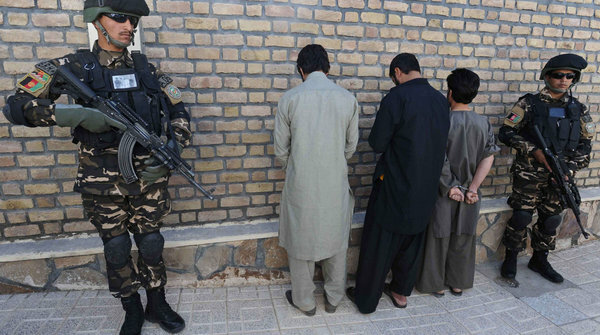 At one point he described that the guards, after four or five months would mostly come to understand the injustice of the prison. But then, they would get rotated out, and they would get another round of them who had to be once again educated. The other thing Omar said that hits everyone who watches is that it’s not the loss of his eye, his broken ribs, the sexual humilitation and degradation that is the worst. It was losing the years of his son’s young life, the joy of seeing him as so innocent, that he will never get back. Omar was at the press conference this afternoon, via live video conference. You can also see a Q&A with him and Moazzam Begg, another released detainee in October, discussing those still remaining in Guantanamo. Last night Clare from Ithaca raised the point that even if Guantanamo is moved to Illinois, there already is torture in US prisons, in the Special Housing Units, where total isolation and sensory deprivation is practiced on people who live in America. 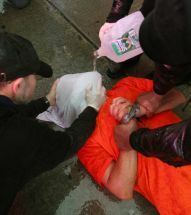 Witness Against Torture posted a report on the Jan 11 activities. Respect to them for a very effective and moving day yesterday, and to Center for Constitutional Rights for bringing the voices of the released detainees and lawyers for the detainees! On the eighth anniversary of the Guantanamo Bay prison, activists dressed in prison suits took to the streets of Washington demanding closure of the facility – something that President Obama promised to do a year ago. WASHINGTON: Human rights groups and former inmates took to the streets in Washington Monday to protest Guantanamo Bay, still open and occupied eight years after it housed its first 21 prisoners. 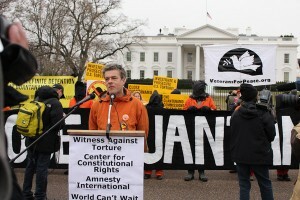 WASHINGTON — Dozens of human rights activists marked the eighth anniversary of the opening of the Guantanamo Bay prison for detainees by protesting by the White House on Monday. 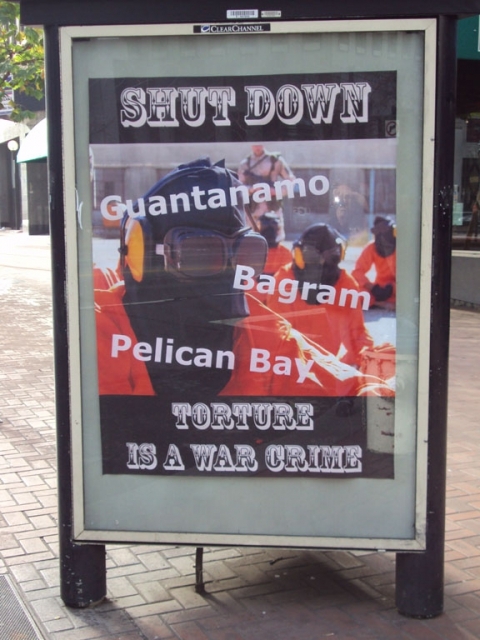 WASHINGTON, D.C. — Eight years ago today, the Guantanamo prison opened for “war on terror” detainees. Today, activists and Guantanamo lawyers mark the anniversary by demanding that President Obama make good on his pledge to close the prison as first step towards restoring the rule of law.